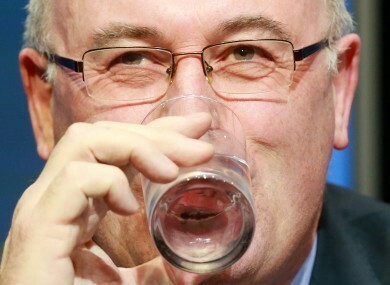 Phil Hogan is now an EU Commissioner. CATHERINE MURPHY TD has claimed that former Environment Minister Phil Hogan lobbied for a company that won an Irish Water contract after he received an e-mail referring to him as ‘Phil’. The company in question is Abtran, which operates Irish Water’s 24/7 call centre in Curraheen outside Cork City. Deputy Murphy claimed that Abtran was awarded the “lucrative contract” despite “high-profile failings” when the company operated call centres for the Local Property Tax and educational grant service Susi. Murphy said that Abtran had “at least 10 other government contracts”, something she said appeared to show a “favouring” of the company in the awarding of State tenders. “Through Freedom of Information I’ve established that on 15 February 2012, the then minister Phil Hogan’s private secretary received a fairly informal email seeking a meeting with ‘Phil’, in order to lobby on behalf of Abtran, ” Murphy told the Dáil today. On the same day at five o’clock an e-mail was sent saying that the minister had agreed to meet the company on 27 February. We know through the work by Gavin Sheridan [and his] minister’s diary that the minister met both the person who sent the original lobbying email, Mr O’Burns, and the co-owner of Abtran. Abtran was awarded the contract in March 2013 and Murphy says it is worth €50 million over four years. The Kildare North TD also said a State investment vehicle made an investment of an undisclosed sum in Abtran in late 2015. Responding to the claims made by Murphy, Irish Water says that the contracts it awards fully comply with procurement guidelines and were followed in this case. “The contract for the operation of Irish Water’s contact centre was awarded after a thorough Europe wide public procurement process,” the company said in a statment. Final tenders were evaluated against a range of criteria and key deliverables with Abtran emerging as the preferred bidder before being awarded the contract. Responding to claims about Abtran’s performance with other state agencies, Tánaiste Joan Burton said that, while there were “teething problems” with the Susi grant system, it was ultimately successful. “The Susi system of college applications is now deemed to be one of the best new systems to be installed by any Irish Government,” she said. The overall Susi project has actually worked very well despite the teething problems. The Tánaiste said that the Local Property Tax system also worked in a “very efficient and very effective way”. Burton added that the government has introduced the Regulation of Lobbying Act to increase transparency. Murphy said that while she welcomes such legislation, in this particularly case the period in question when the contract was awarded lies outside the Irish Water’s FOI window by “a number of weeks”. The deputy went on to say that securing information from Irish Water through the use of FOI is “like pulling hens’ teeth”. Email “Catherine Murphy: Irish Water company met with 'Phil' before getting 'lucrative contract'”. Feedback on “Catherine Murphy: Irish Water company met with 'Phil' before getting 'lucrative contract'”.